PoPville » Dear PoP – Food truck fiasco/showdown today in metro center! Dear PoP – Food truck fiasco/showdown today in metro center! I went out to go try Takorean today for lunch. After waiting in a long line, I was about 3 people away from the front of line when a cop car pulls up (lights blazing) and asks for his food licenses and papers. He orders the truck to shut down and says that while he has the correct licenses to do business, he doesn’t have the license “to do business here”. 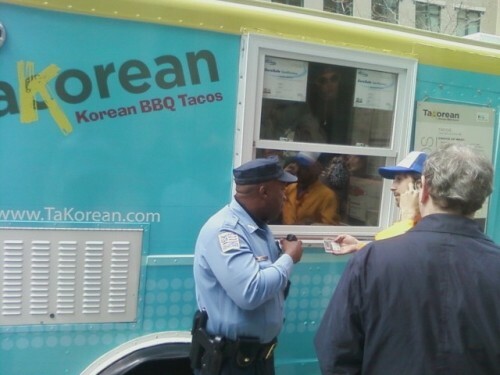 The cop told me that someone had called in to him saying that the Takorean truck didn’t have the correct licenses. The truck owner said that he did, and was getting someone from Takorean HQ to bring them out. Anytime food is handled/served/sold I believe DCRA papers are required. I’d be surprised if a big truck like Takorean didn’t have them, though it is odd that they apparently weren’t in the truck. Anyone else witness this scene? Who do you think will win this apparent battle – food trucks or brick and mortar restaurants?